There a lot of beautiful women in China who are even regarded some of the most beautiful women in the world. Some of these Chinese women have been able to participate in both local and international beauty contests. Others have had successful careers in different fields where their beauty has been one of the most outstanding features about them. Most of these Chinese women are considered beautiful mainly because of their physical appearances. There are also other aspects that are considered such as their characters and ability to express themselves. Because of the fact that there are many beautiful women in China it might be challenging to come up with a list of the most beautiful women in China. But with consideration there are certain women who standout especially when it comes to physical appearances. Here is a list of the top 10 most beautiful women in China. Zhang Ziyi is an actress who is commonly regarded as one of the best actresses to ever come from China. She was born in 1979 and she made her debut in the movie known as ‘The Road Home’ which was released in 1999. Since then she has featured in many other Chinese movies and she has won more than twenty awards. Her name has featured in many lists which have been trying to show the women who are most beautiful in China. Her personality compliments her physical appearance consequently making her the most beautiful woman in China. Xu Jinglei started her career as a director but later became a writer and an actress. She might not be famous outside China but she is very popular in her home country especially because of featuring in different Chinese based movies. She won her first award as an actress in 2003 and this has played a significant role in increasing her popularity. She is also featured in different national advertisements and she is also very popular in the social media. This is one of the most attractive women in China mainly because of her physical appearance. She was born in 1986 and she has featured in different movies as an actress. Her popularity has significantly been contributed by the fact that she has participated in some top class movies which have become popular internationally. She is also featured in many advertisements mainly because of her attractiveness. Besides being beautiful she is also considered to be one of the most humble celebrities in China. In most events where Chinese celebrities are invited she is usually invited because she is one of the most known and most beautiful women in China. Zhao Wei is also known as Vicki Zhao and she is mostly known because of her acting career. Her most popular movie was ‘Shaolin Soccer’ where she had a lead role. She has also feature in many other popular movies which have global audience. Besides being an actress she is also a director and a singer. In fact, she has a music album to her name and therefore she is also an established singer. Throughout her career she has been able to win a number of awards both locally and internationally. Zhou Xun was born in 1974 and she is listed in many lists of the most beautiful women in China. This is mainly attributed to the fact that she is a popular actress who has been features in some of the most popular movies from China. The fact that she is regularly featured on TV screens makes her standout and also puts her on the limelight more. Throughout her career she has been able to successfully win a number of awards. Some of the most popular movies which she has been featured include ‘SuZhou River’ and ‘Balzac’. Zhang Jingchu is the highest paid actress in China and her outstanding beauty is the main feature which made her acting career successful. She studied in the famous Central Academy of Drama in Beijing and after graduating she ventured into acting. Despite being the highest paid actress in China she came from a humble background but she has been able to turn her fortune and that of her family. She is a common face on TVs in China because besides her acting career she has also been featured in many advertisements. Fan Bingbing is regarded as a multi-talented celebrity because she participates in different aspects of the show business in China and around the world. Her talents were noticed when she was still young and as a result she has grown as a celebrity since she was a small girl. For a number of years she has been featured in many lists of the most beautiful women in China. She has also contributed a lot in the development of many upcoming talented actresses and musicians. She has also participated in humanitarian efforts both in China and in other parts of the world. Gao Yuanyuan is both a model and an actress. She is able to combine both these careers where she has successfully model clothes by some of the top designers and at the same time has been featured in some of the top movies. She was in one of the main advertisements which were featured during the 2000 Olympic Games. Her beauty has seen her become a role model to many young girls who are aspiring to become either models or actresses. She is also widely travelled where she has been to different parts of the world to promote her career. Chi-Ling Lin is better known as a commentator but she is also an actress and a model. She has her roots in Taiwan but she is rightfully regarded as one of the most beautiful women in China because for all her career she has been in China. She has hosted a number of TV shows and has also been featured in a number of TV shows. She also participates in different modeling competitions in different parts of the world. Her outstanding beauty makes her a big attraction even when among other actresses or other models. 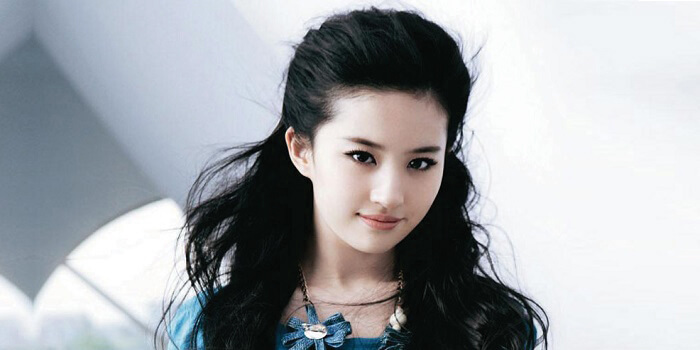 Liu Yifei was born in China but has both the citizenship of China and America. This is because she moved to New York, USA at the age of eleven together with her mother. She came back to China in the year 200 and has been featured in different activities in the Chinese show industry. She is a model, a singer and actress. Throughout her career she has been able to win numerous awards in all the fields she participate in. she has also been involved in the development of young girls who would like to be in the show business. It is evident that China has a lot of beautiful women who have different features. Most of these women are in the show business and their popularity has made them more visible. Some of them have joined the show business because of their beauty but others have been noticed after already being in the show business. These beautiful women have also given back to the community in different ways such as supporting the upcoming talents or participating in charity work. Therefore, through going this list of the top 10 most beautiful women in China it is easy to tell that China has some of most beautiful women in the world.